17Six days later, Jesus took with him Peter and James and his brother John and led them up a high mountain, by themselves. 2And he was transfigured before them, and his face shone like the sun, and his clothes became dazzling white. 3Suddenly there appeared to them Moses and Elijah, talking with him. 4Then Peter said to Jesus, ‘Lord, it is good for us to be here; if you wish, I will make three dwellings here, one for you, one for Moses, and one for Elijah.’ 5While he was still speaking, suddenly a bright cloud overshadowed them, and from the cloud a voice said, ‘This is my Son, the Beloved; with him I am well pleased; listen to him!’ 6When the disciples heard this, they fell to the ground and were overcome by fear. 7But Jesus came and touched them, saying, ‘Get up and do not be afraid.’ 8And when they looked up, they saw no one except Jesus himself alone. 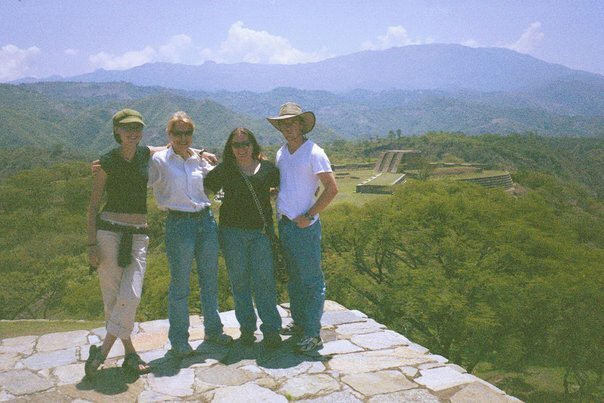 The summer I turned 19, I spent 7 weeks working for a faith-based environmental nonprofit in Guatemala. The big adventure of our summer was an immense climb up the tallest volcano in the country—Acatenengo. It took us 7 grueling hours to reach the summit, but when we did, I felt unbelievable—like I was standing on top of the world. I was tired enough that I was ready to stay up there indefinitely and just forget about the world below. But it was cold and wet in that cloudy height and so after our excruciating climb, we stayed at the top just long enough to take a couple of photos and then we were gone—back down the mountain. I had thought the climb up would be the hardest part. I was wrong. The descent took less than half the time, mainly because the incline was so steep we had to run down, one switchback at a time, pausing only momentarily to catch our breath in the altitude. I developed a mantra to compel me forward, muttering over and over again, “I can because I must! I can because I must!” By the time we reached the bottom, my knees were so weak from the effort they could hardly hold me up and I collapsed onto the grass to rest. We love our mountaintop experiences, don’t we? Especially when it comes to our lives of faith. We love the sense of euphoria and peace and joy they bring—the clarity of belief, the high of reinvigorated faith. I have had many such moments in my life—though perhaps none quite so literal as this volcano climb in Guatemala. And it’s these moments I found myself remembering as I read our scripture for today. How could I not? This passage in Matthew – in which Jesus’ closest disciples encounter the paragons of their ancient religion and see their friend and leader transformed into the brilliant, shiny, son of God, “real Jesus” – this biblical moment we call the Transfiguration, is surely the most powerful “mountaintop experience” of all time. The peak isn’t the point. The mountaintops of our faith are not, in fact, what faith is all about. And this shiny, divine transfigured Jesus revelation is not the real miracle that this passage reveals to us. This is what Jesus is telling the disciples when they stumble upon this mountain moment. This is what God is saying they should listen to. Knowing this, I suddenly understand their desire to stay on top of the mountain a whole lot more. I don’t blame them for wanting to camp out in that cloud and forget the world far below. In fact, as we look toward Lent and our dark season of penitence which stands in the ever-growing shadow of the cross, I find that I am more and more empathetic to Peter’s desire to stay. But that brings me to the last surprise the passage held for me. That is, what comforts these trembling disciples is not simply the shiny, Son of God “real” Jesus of the transfiguration, but rather that that same “real” Jesus is Jesus their friend, the human person with the human hand that reaches out to them and says “do not be afraid” and goes with them down the mountain. This. This is the moment of this story when I know for certain the mountain peak isn’t the point. And the Transfiguration, for all its glory, isn’t the most startling miracle of this scene. This is the miracle. Jesus touches them. Jesus goes with them. Jesus—shiny, transfigured Son of God who could certainly stay in peace on top of that mountain if he wanted and avoid all the ugliness that he knows awaits him—comes right down off of that mountain to be with us. Jesus knows that the mountaintop isn’t the only important part of the story. No, those most important moments of Christ’s life and death and resurrection didn’t happen on mountaintops. They happened in a stable and around rough hewn tables in dimly lit rooms, and on a rocky hill alongside—not Moses and Elijah—but two common criminals. Those moments weren’t shiny, but they were holy and—transfigured or not—they did change everything. Jesus chooses to stay with us. With and for us. In and for the world. And so if we are to be with Jesus, we too must come down from the mountain. If we would be with Christ, we must choose to be with each other. Mountaintop experiences are not bad things. They energize us. They give us glimpses of the kindom that is promised. They make us feel closer to God and give us hope. But when we let their brilliance and their euphoria become the point of our walks of faith, we can forget that what happens off the mountain really matters. We forget that faith—as exemplified by Christ—is about being willing to face the ugly. To name and confront the brokenness. To stand with one another and cry out in the face of unholy pain and injustice. To hold each other in the darkness. To dare to be with—whatever knee-breaking, breathlessness that entails. It can be compelling sometimes, to rest in our comfort. To celebrate the good we’ve done. The service we’ve rendered. The righteousness we’ve aimed for. The prayers we’ve said and the scriptures we’ve upheld. And forget that there is still so much to confront, so much to do. When we stay on the mountaintop, we forget that the kingdom is not yet here, and the world to which Christ calls us—the world in which Jesus comes to be with us—is a world that is still broken. Jesus is not on the mountaintop. Jesus, Son of God, is here. In the messiness. In the ugliness. With us. And even when it is terrifying or exhausting or seemingly impossible, even when it makes us weak-kneed or worse, being with Jesus means coming down from that mountain and figuring out how to truly be with each other. We can because we must. My summer in Guatemala wasn’t short on powerful experiences. But the most transcendent faith encounter I had didn’t happen on that cloudy volcano summit. It happened a few days later, when I sat on my still-sore knees on the dusty floor of a one room shack, and listened to a dying Mayan woman cry out in sorrow for what she had lost and in fear that she would be forgotten. I promised that I wouldn’t forget her. We belong to an incredible God. And the most incredible thing about that God is not the brilliance of divinity or the magnitude of absolute power and might or the utter incomprehensibility of transcendence. The incredible truth of God, known to us in Christ, is that we have never been forgotten or abandoned. Not one of us and not once. Christ’s amazing grace is that he came down from that mountaintop into the ugliness and he didn’t even hesitate. We don’t need a mountaintop to be with him. Christ chooses to be with us, and so when we are truly with each other, we are with Christ too.